Recently, more and more people suffer from data loss in iOS 9.3.2 upgrade with error messages, so many of them are searching solutions on how to recover deleted videos from iPhone on the Internet. Actually, you can retrieve deleted videos from iPhone in 2 different ways: Restoring iPhone with iTunes backup; or recovering deleted iPhone videos from iTunes backup with iPhone data recovery software. Therefore, the post will show you how to recover deleted videos from iPhone with iTunes and two iPhone video recovery programs. You are able to choose one of them as you like according to your actual need. 1. Plug iPhone into computer with the USB cable, and iTunes will start automatically. If not, you need to manually start it. 2. iTunes will recognize your iPhone and display the iPhone icon at the upper right corner. Click the icon and then choose “Restore Backup” in the summary panel. 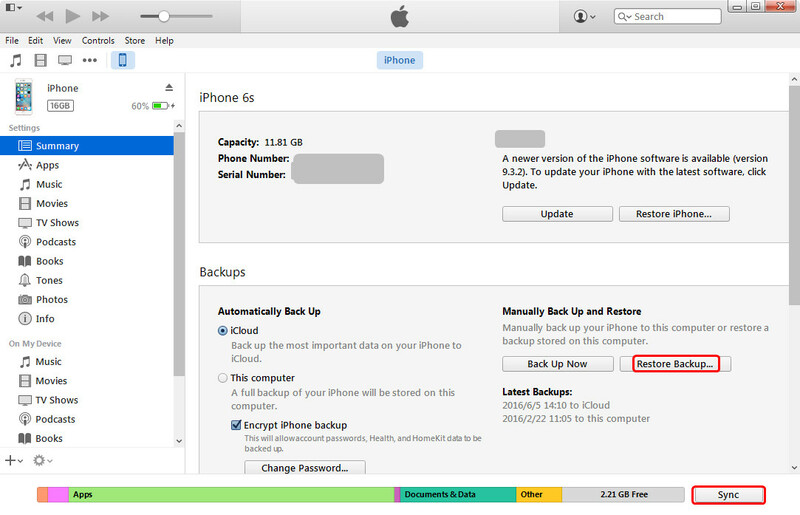 3. iTunes will show all the backups you have made in the main interface. Choose the iPhone backup and then click “Restore” at the right bottom. 4. When the restoring process is done, you will get the lost videos back to your iPhone. However, what you should note is that some data won’t be backed up by iTunes or iCloud, like iPhone photos and videos outside the Camera Roll, iPhone music/videos/movies which are not purchased from the iTunes Store, so the data can’t be restored through iTunes. What’s worse, restoring iPhone data using iTunes will remove all the current data on your iPhone and replace your iPhone data with the previous iTunes backup files, which means the files you add to your iPhone after sync or backup will be removed and lost. Then how to retrieve deleted videos from iPhone without erasing any data on your current device? I’m afraid a third-party data recovery software is needed. Here are two pieces of iPhone video recovery software recommended for you. iPhone Data Recovey is capable of restoring lost media files from iOS devices/iTunes backup/iCloud backup with or without iTunes/iCloud backup. It supports all video file types including MP4, Flash, 3GP, AVI, etc. Its user friendly interface helps you recover information with just a few clicks. There are three ways to recover deleted videos from iPhone with iPhone Data Recovery: Recover deleted videos from iPhone directly, retrieve videos from iTunes backup, and extract videos from iCloud backup. Launch iPhone Data Recovery on your computer and connect to your iPhone with USB cable. 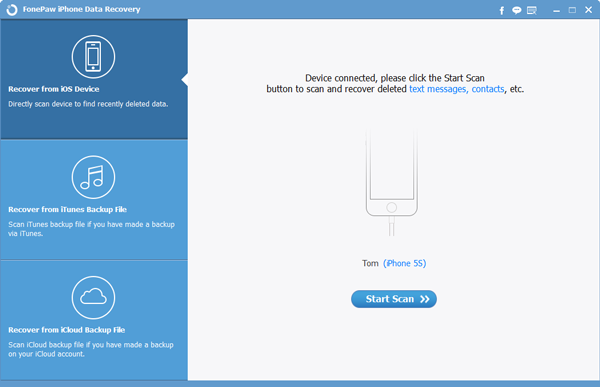 You can choose Recover from iOS Device, the software will scan iPhone for lost and existing data. For just a few seconds, your lost data will be displayed on the interface as below. You can preview them before deciding which files you want to retrieve. After choosing, click “Recover” to get back your files. Choose Recover from iTunes Backup File, and iPhone Data Recovery will list all iTunes backup files as below. Check your iPhone backup and click “Start Scan”. In this step, select “Videos” and preview its contents in the window. Then click “Recover” button. All the information you want will be retrieved to PC. Select the third mode and enter the Apple ID and password of your iCloud account. After that, you may download your latest backup. After downloading, select the files you need and click “Recover” to save them on your computer. Another powerful iPhone video recovery software is Leawo iOS Data Recovery. The best iPod/iPad/iPhone data recovery software can scan and extract iTunes backup to recover deleted iPhone videos. If you haven’t synced or backed up your iPhone before data deletion or data loss, you can directly scan and recover deleted videos from iPhone with help of the iPhone recovery tool. The following guidance will show you how to recover deleted videos from iPhone with Leawo iOS Data Recovery. You are allowed to free download the software to have a try. 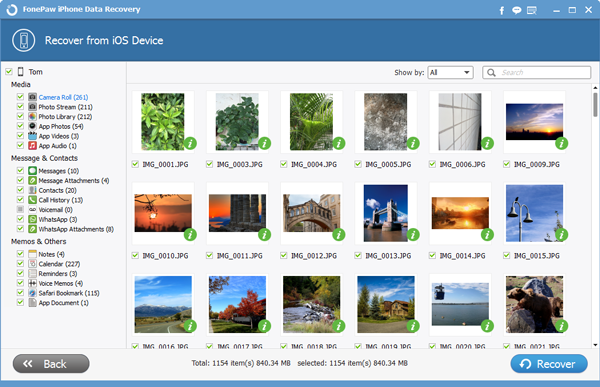 Just download free trial version of Leawo iOS Data Recovery, and launch it on PC, then connect the iPhone to the computer by using a USB digital cable. Choose Recover from iOS Devices and click “Start” to scan your iPhone. Select the photos you need. Then click Recover at the right bottom. Then hit Open in the pop-up dialog and choose a target folder on your computer. Then click Go to start retrieving photos from iPad. Choose Recover from iTunes Backup. Select the iPhone backup and click Scan at the right bottom, then Check Camera Roll and select the videos you need. Then click Recover. Click Open in the pop-up dialog to choose a target folder on your computer. Then click Go to start recovering deleted videos from iPhone backup. Choose Recover from iCloud Backup and Enter your Apple ID and log in. Select the iPhone backup and click Download at the right bottom. After the program downloaded the backup, check Camera Roll and select the videos you need. Click Open in the pop-up dialog to choose a folder on your computer. Then click Go. The following chart is about the comparison between the two pieces of iPhone video recovery software and iTunes, and you can choose anyone you like according to your actual need. Maybe there are other methods that could help you know how to recover deleted videos from iPhone with ease. You can feel free to have a try.